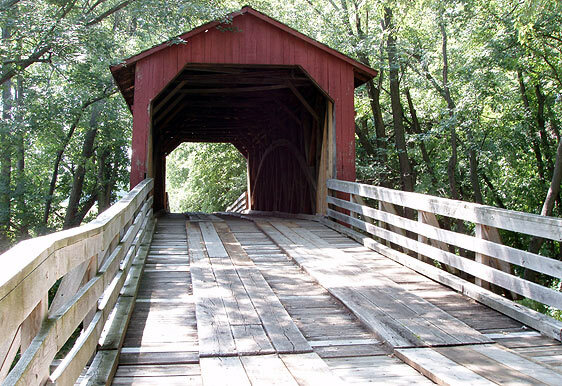 Frequently, photos from a trip sit in my files, just waiting for a topical moment to hop onto the net. This is one of those times. 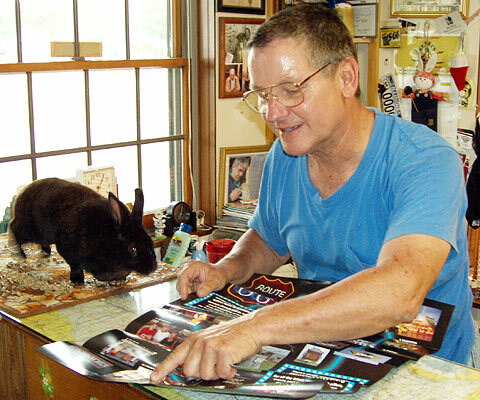 Rich Henry of Henry's Rabbit Ranch in Staunton, Illinois, has entered the above photo of himself and Montana, his pet rabbit, in a Humane Society contest. Voting continues through today and Thursday, and will be tallied Friday. Click here to vote for Montana You'll have to click through a couple of pages. We did, and I'll tell ya why. We were running late that roadtrippy day in July of 2006. 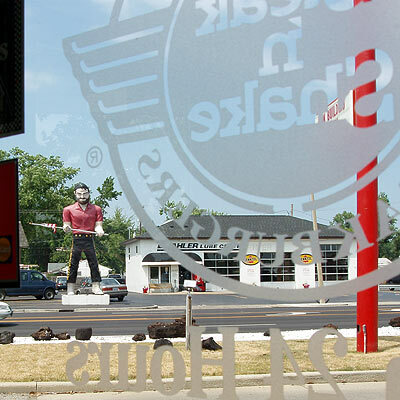 We'd stopped everywhere between Springfield and here to take photos and eat...commune with a muffler man and eat again...take more photos...you get the idea. It was a Sunday too...not good for catching people open, and it was too late to make it to Henry's Rabbit Ranch during his normal hours. It helps to have a support crew; my brother back in Joplin called ahead to Henry's, and Rich said he'd be happy to stay "Sorry We're Open" a little longer for inbound roadies. We made it there with plenty of sunlight left. 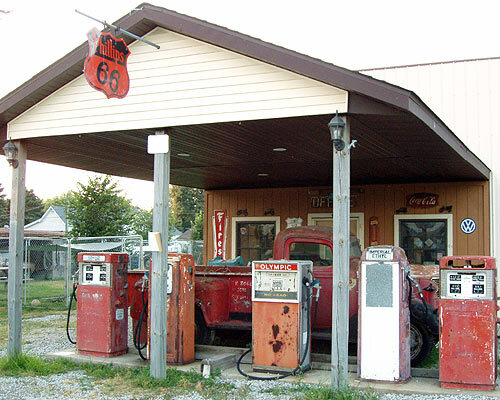 Route 66 enthusiasts will recognize that "Hare It Is" is a play on "Here It Is", the slogan of the iconic Jackrabbit Trading Post in Arizona. 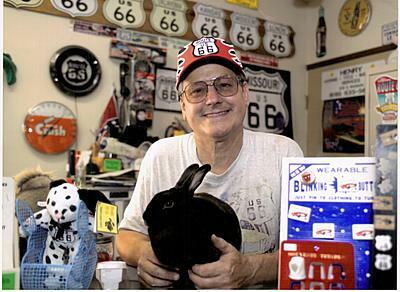 Rich and his wife, Linda, have operated a Route 66 info center/souvenir-gift shop since 1995. 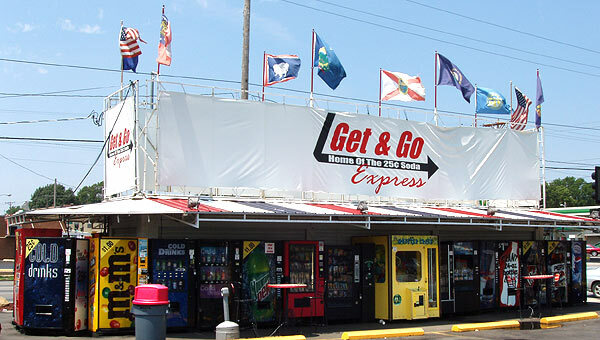 The entrance is decorated with a faux gas station facade. As to the gas station...funny story there: According to a page on Rich's website, the EPA once stopped by looking for buried gas tanks. 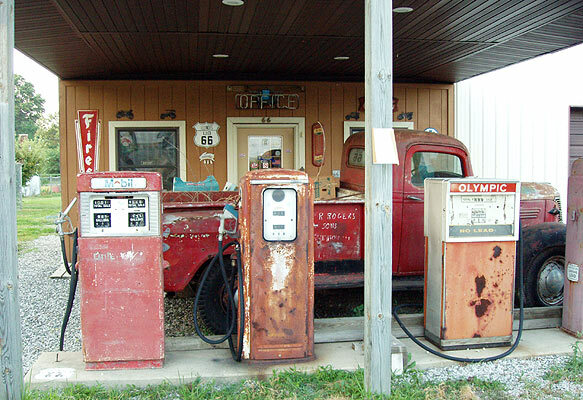 He eventually convinced them it was never a real gas station. 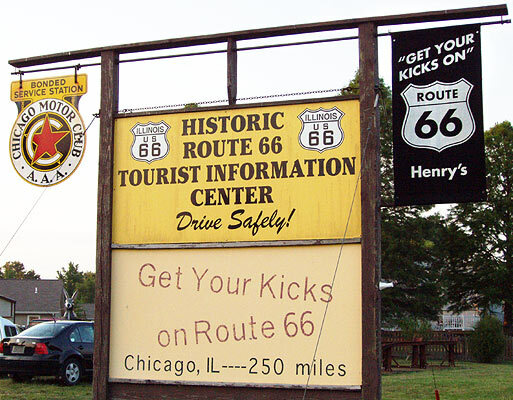 Inside, Rich proved to be a worthy representative of Route 66 for Illinois, as well as for attractions in a number of other states. Here, he makes sure we haven't missed anything on this poster. As you can see, Montana is hopping over to help. Not content to sit idly by, Montana performed for us. She's such a good ambassador that Ace may offer her a cabinet position in his new administration. 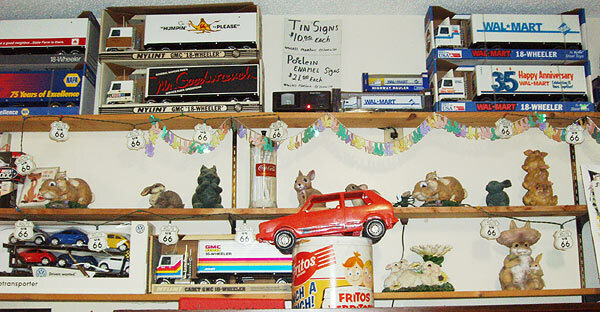 Around the room is a pleasant collection of "stuff" - some for sale, and some for show. 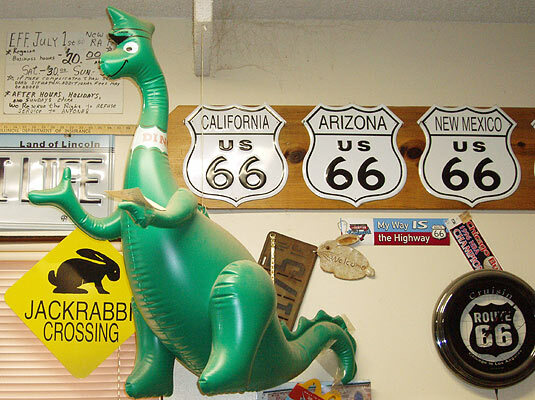 I have to love a place with one of the 1963-design Sinclair dinosaurs on display. Sinclair marketed these beach toys just prior to the 1964-65 World's Fair, allegedly to demonstrate the use of petroleum in plastics, and kept them in production with few modifications until the late 1990s. And that was your trivia for the day. 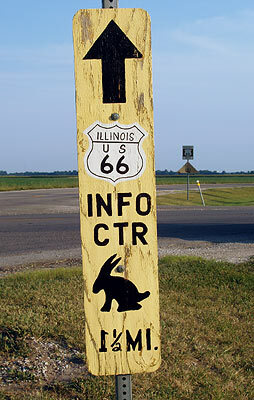 The "Jackrabbit Crossing" sign is a present from the Jackrabbit Trading Post, which Rich plugs on his website. 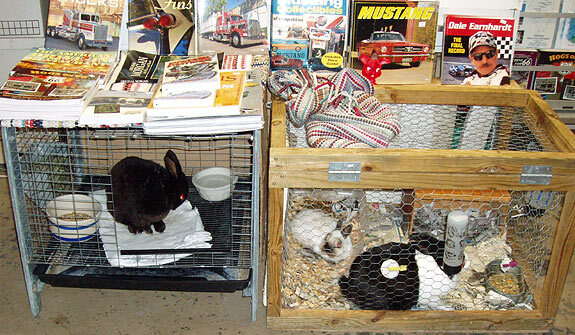 The building also houses a number of other bunnies. 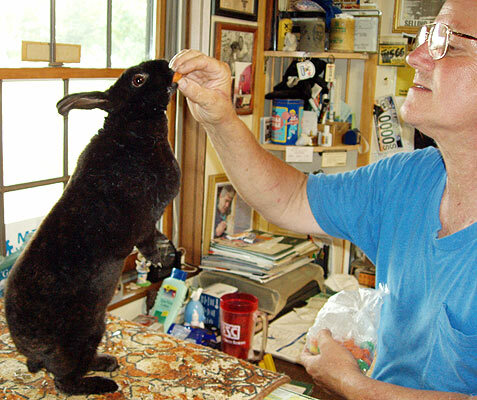 His initial interest in rabbits stemmed from a population explosion resulting from their daughter having pair of the critters. This confirms that bunnies not only breed with antelopes to create jackalopes, they apparently also take a liking to each other. Rich has quite the collection of Campbell's "Humpin' to Please" trailers. He owns the trucks, too. 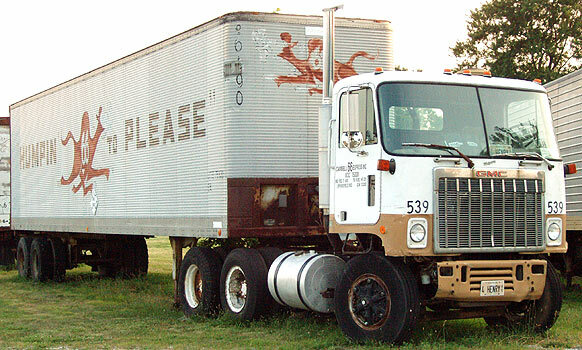 The defunct company's mascot was "Snortin' Norton." 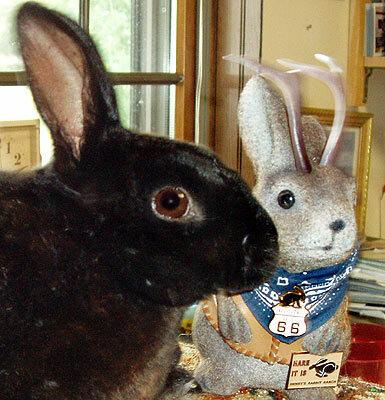 Henry's Rabbit Ranch was recognized by the Hampton Inn's "Save a Landmark Program" in June of 2003. Rich has a collection of - what else? - Volkswagen Rabbits. 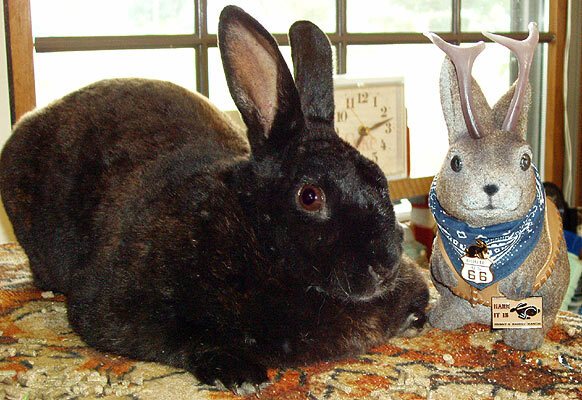 He tells me that since the time of this photo, three of the rabbits are buried "Cadillac Ranch" - style. 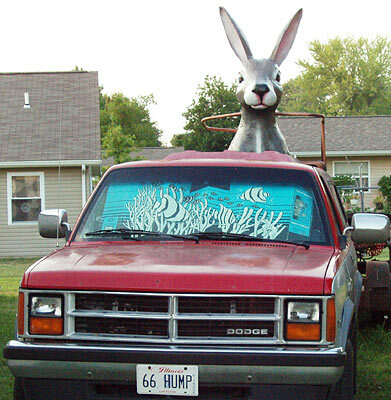 And there's a truck with a fiberglass jackrabbit. I bet it'd be fun to drive in a parade. 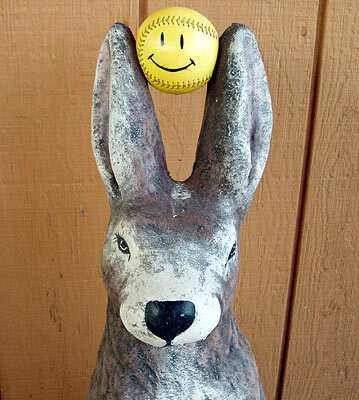 I believe this is the same design as one used at the Jackrabbit Trading Post. 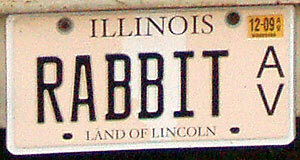 It isn't hard to find more rabbits around here. 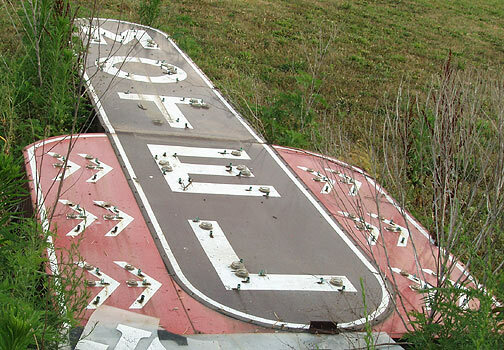 But the true outdoor treasures waited like Easter eggs in the grass - vintage motel signs, rescued from ruin and awaiting display. 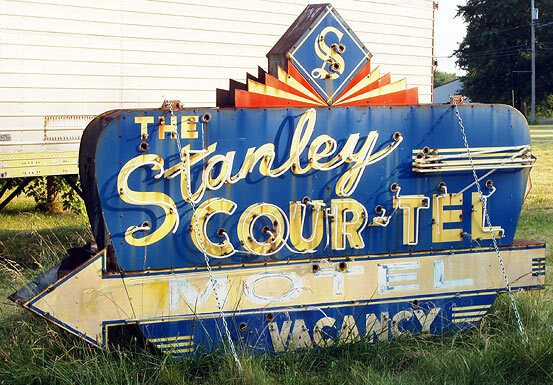 The Stanley Cour-Tel signs were moved here in 2004 after the motel was razed for St Louis airport expansion. 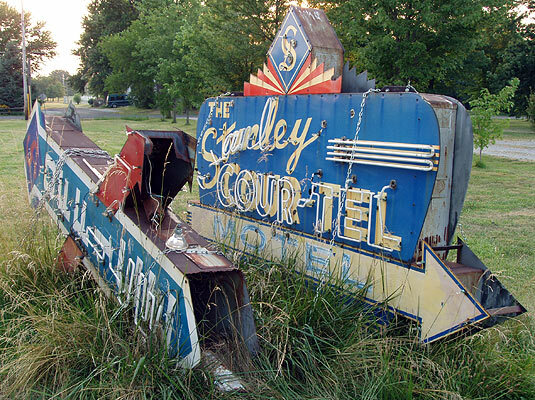 I believe these other two signs may be from the Lin-Air motel. Perhaps Rich or someone else can comment and clarify. 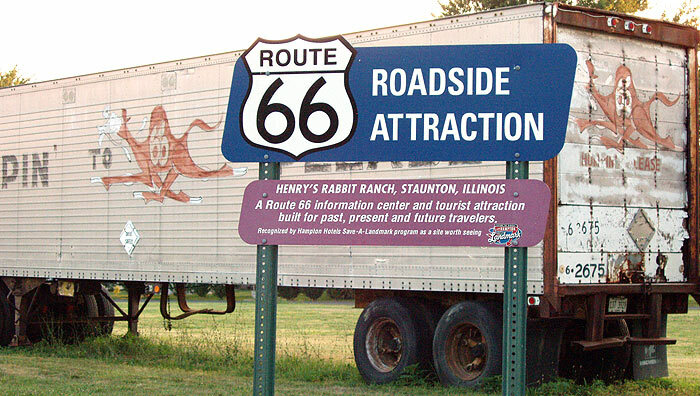 Henry's Rabbit Ranch was our last substantial stop on our five-day Chicago to St. Louis trip, and one of the most memorable. 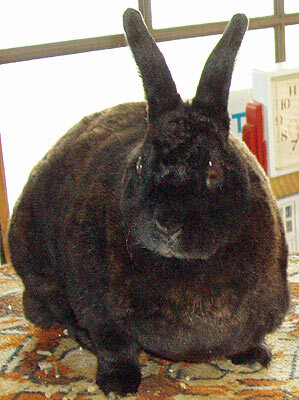 Update added June 25, 2008: Montana was found dead of natural causes this morning by her owner, Rich Henry. She died, I would suspect, of old age. Montana had joined Ace and the human candidates in a bid for the Presidency of the United States a bit over a week after this post was first published. Ace considered her to be a worthy, respectable (and beautiful) opponent. 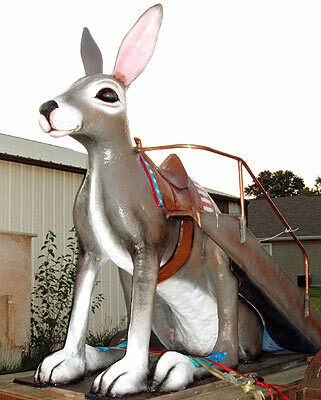 As for me, I never saw a more regal rabbit. 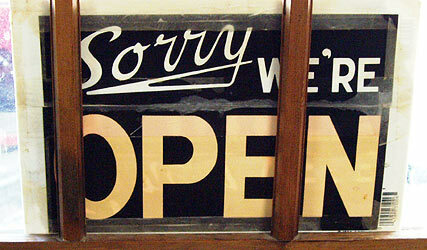 The other signs are, indeed, from the Linn-Air. 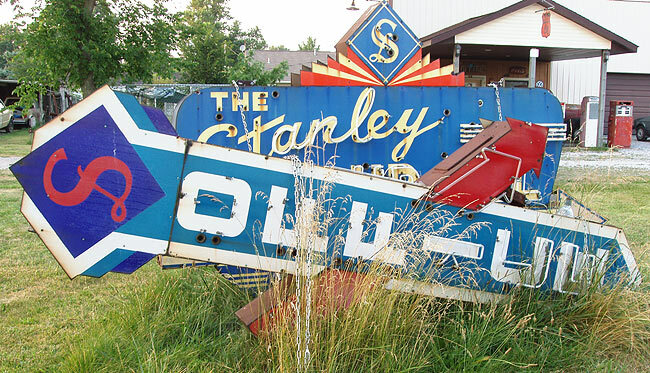 Friends of the Mother Road helped orchestrate the rescue of both sets of signs when we learned the impending airport expansion had doomed the motels they advertised. 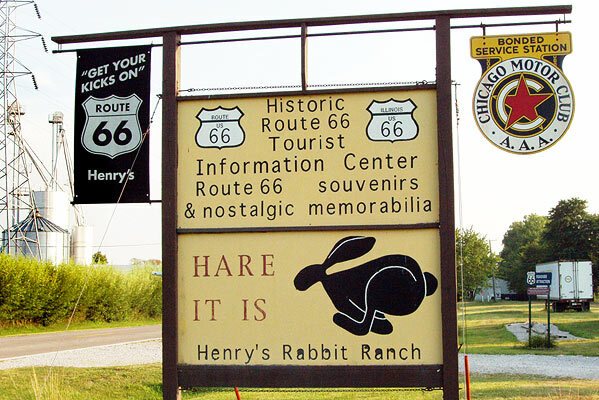 Ace Jackalope, you did an excellent blog on Henrys Ra66it Ranch. Love the notoriety given to Montana. She never looked so good as in your pictures. You need to hop back in and see the bunny changes that have taken place. The number totals have decreased to present number of 14, but the size of those has increased immensely compared to Montana and her playmates. Thank you so much for the time you put into the blog. 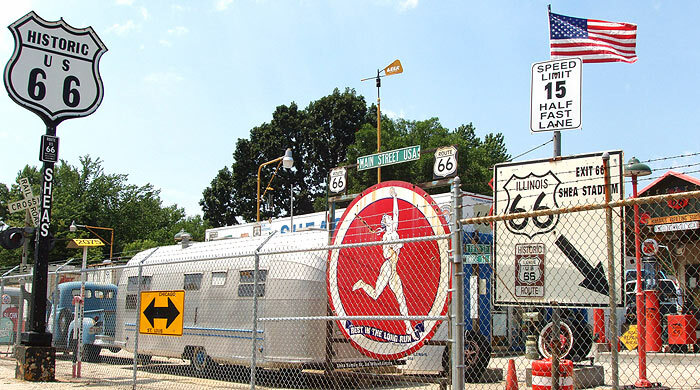 Your friends to the East on Old Route 66 @ Henrys Ra66it Ranch, Rich and the fabulous fourteen ! !